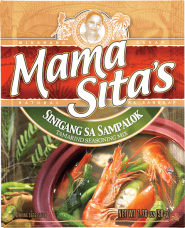 This distinctively sour and tangy shrimp soup made with Mama Sita’s Sinigang sa Sampalok Mix is served with a healthy selection of fresh vegetables. Tip: Half-kilo (1.1 lb) of fish, pork, or beef knuckles, previously boiled until tender, can be used instead of shrimps. In a saucepan, combine water, tomatoes, onions and radish. Bring to a boil. Simmer for 5 minutes. Pour in Mama Sita’s Tamarind Seasoning (Sinigang sa Sampalok) Mix. Increase the heat and bring to a rolling boil. Add prawns. Add long green beans, green pepper and fish sauce (patis) to taste. Cover and simmer for another 3 minutes or until the prawns are cooked. Turn off the heat and add the green leafy vegetables. Cover to steam-cook vegetables.